Raw hems and spring florals are a match made in heaven! Hello shabby-chic. Today’s post is dedicated to these two styles. My closet typically holds very classic pieces, but now and then I have to say it is fun to welcome what’s trending now. Here’s a fresh take on an old favorite skinny jean: the Suki Ankle Skinny Dark Wash with a frayed hem by Silver Jeans Co. If you have been following me on Instagram & Instastories the past month, you know I have both a deep love for the Silver Jeans fit, and have owned various washes and styles of Silver Jeans – loving them all. I am a girl with curves in the middle (if you know what I mean), and I don’t want gaping around the waist because of that – which is what brought me to the Silver Jeans brand years ago in high school (and keeps me coming back!). The fit of these “Suki” jeans is Silver’s “Fluid” Denim where it gives stretch, yet hugs, lifts, and shapes. I got size 25, and they move with me really well. Grace and Lace is on a mission. They do more than create feminine, girly styles for every season – they are using their business as a platform to help others. Read more about what they are doing in India and Nepal here. 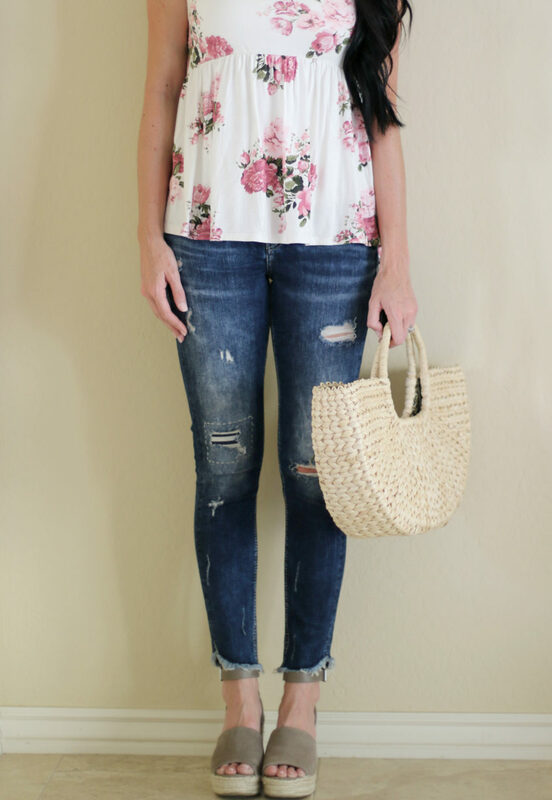 Let’s talk about this new spring style: the Sylvie sleevless floral tank. It is soft, flowy, and has the perfect amount of stretch. Wear it with your favorite jeans or shorts, and you’ve got the cutest summer #OOTD! I chose to wear a cami under mine, and paired it with a summery basket-weave bag.